Tonight is the ninth episode of The Vampire Diaries and it is called ‘Homecoming.’ Stay tuned as we cover the show with up-to-the-minute details.On last week’s episode we learnt more about the Original Families, the names carved on the wall are those of the families and Elena, Alaric and Damon try to decipher the writing. Klaus’ sister Rebekah revealed some of her family’s ancient secrets and the violent past she shares with her brothers Klaus and Elijah. Although last week’s episode focused on the Original families, Episode 9 will focus on the kids again as they prepare for Homecoming. Tonight is the finale of the first part of the season and Vampire Diaries is going on it’s pre-season break. The show will return and continue their already-in-progress seasons on January 5. Will you be missing the show as much as I will. Tonight’s episode: The show opens tonight with Stefan calling Klaus. Stefan tells Klaus that his father is dead – Michael. He tells Klaus he has been daggered. Klaus tells Stefan he has to tell him how it happened but seems to accept that it’s true. Meanwhile, Michael, Damon, Elena and Stefan have a plan to lure Klaus back and destroy him. Michael has a dagger with which they can kill him and then they will lure Klaus back. Elena takes the dagger and stabs Michael – a vamp can’t kill an original without dying so it has to be Elena. Klaus is skeptical and asks to speak to Rebekah and Rebekah confirms that it is true. She tells Klaus she misses him that she is miserable without him. Rebekah hangs up and tells them that Klaus bought the story. Elena then goes over and pulls the stake out of Michael. Rebekah sits by and waits for Michael to come back alive. Rebekah is not impressed with Michael and tells Michael that Elena has the dagger. She tells Michael he destroyed their family and it was not Klaus. Elena is trying to find a dress in her closet for Homecoming. Bonnie tells Elena they don’t have to go but Elena tells Bonnie they have to go because Caroline will kill them. Bonnie tells Elena that she cannot talk to her about Jeremy. Elena tells Damon that they cannot trust Rebekah. Just because Rebekah is mad at Klaus now it does not mean she will stay mad at him. Damon tells Elena not to worry he has a plan B. Elena is preparing Wolf-bane grenades and Stefan is not confident that they will be able to defeat Klaus. Caroline is decorating for Homecoming and Tyler is trying to convince her to go with him and Rebekah to feed off people who are willing. Tyler tells Caroline that he set Rebekah up with Matt and she is not impressed. Rebekah is getting dressed for Homecoming and she tells Elena this is her first High School dance. Rebekah asks Elena if she has heard from Klaus to which Elena replies NO. Rebekah tells Elena she wants to go to the dance and leave the rest to Michael. Elena thanks Rebekah for helping them. Rebekah warns Elena to be careful that Klaus cannot be trusted and no one else can be trusted in his family. Rebekah is upset because she never thought she would be the one to help drive a stake through Klaus’ heart. Elena tells Rebekah she looks amazing but she is missing one thing and she gives Rebekah her mother’s necklace. Rebekah is touched and then Elena stabs her with the dagger and apologizes and tells her she cannot leave anything to chance. Damon comes in and covers Rebekah with a blanket. Elena explains why she did it and asks Damon if he trusts Michael or Stefan. Damon tells Elena he knows what to do but when it all goes down he wants her to have nothing to do with it and to be safe. Over at the high school there are sirens and Caroline asks what happened and Tyler tells her that there was a flood so they are moving the party. Matt arrives at the house for Rebekah and Elena tells him there is a problem with his date and how would he like a backup date. Caroline arrives at Tyler’s house and the party is in full swing. Stefan tells Tyler that it is a great party and Tyler tells Stefan it is not a party it is a wake it is what Klaus wants. Then on the stage where the band is playing – surprise surprise – Klaus stands up goes to the mike and welcomes everyone and tells them it has been a long time coming. Yikes. Matt’s replacement date is Elena, Matt thinks it is weird them being together and so does Caroline! 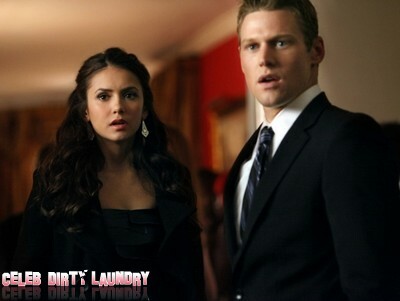 Caroline tells Elena and Matt that Klaus is here. Caroline asks Matt what is going on – he is suppose to be with Rebekah. The band is playing… . Stefan is speaking to Klaus and tells Stefan now he can reunite his family because Michael is gone and not they can let bygones be bygones. Klaus asks Stefan where his sister is and Stefan tells him he has no idea. Klaus wants Stefan to bring his father Michael to him and once he does he will get rid of the compulsion he has over him. Michael asks Damon if Rebekah went to the dance and Damon tells him yes. Damon asks Michael if he has the stake and he shows Damon the only stake in the world than can kill an original. Damon asks why he feeds on vampires and Michael tells him he rather feed on vampires then the innocent. Stefan comes in and tells him the plans have changed that Klaus is back. Michael turns around and fangs come out and he bites Stefan and he passes out. They don’t want Michael around. Klaus is talking to Tyler and he is happy that Tyler came through for the party. He asks Tyler if he knows who the people are at the people. Tyler tells him he does not know half the people who are here. Klaus tells Tyler that a lot of people present are hybrids that he sired from the Heartland. He tells Tyler if someone goes against him the hybrids will attack them. Tyler comes into the room and asks Caroline what she is up to with Klaus and Caroline tells him she does not know anything. She does tell him even if she did know something she would not tell him because he is sired to team Klaus. She ask him to go back to the party and he sticks a syringe in her neck and she passes out. Klaus asks Elena where her date is and he thanks her for killing Michael. Klaus tells Elena that people have been after him for 1,000 years and whatever they do it never works. So he tells her to go for it. Matt comes in and sees that Tyler has done something to Caroline – he has vervained her and he tells Matt to take Caroline out because something is going to happen. He wants to keep her safe because he has no choice but to protect Klaus. Damon comes to the party and attacks Tyler. Tyler tells Damon whatever move he makes Klaus will stop him. He goes to stake Tyler and Bonnie stops him by putting a migraine spell on both of them. Bonnie sees that Damon has the stake to kill Klaus. A girl comes over and tells Klaus that he has a visitor and that it is Michael. Klaus tells everyone to leave so he can chat with his dad. He tells one of the hybrids they know what to do. Klaus tells Michael to come in but he cannot because he has not been invited. As the hybrids gather outside Klaus tells Michael that they could tear him limb from limb. Michael tells Klaus they may be werewolves but they are vampires too and they can be compelled by him. The battle looms. Michael grabs Elena and tells Klaus that he is going to kill her. He tells Klaus that if he kills Elena there will be no more hybrids. Michael tells Klaus he has no one really behind him and Klaus tells Michael he is calling his bluff. Klaus tells Michael to kill Elena and Michael taunts Klaus to come out. Klaus screams at Michael to kill Elena. Michael tells Klaus his impulse is the one thing that stops Klaus from ever being great and then he stabs Elena. Damon stabs Klaus in the surprise with the special stake and is killing Klaus and then Stefan appears and jumps in and pulls the stake out and gives it to Klaus and Klaus kills Michael. It was Katherine NOT Elena – so Elena is safe. Damon asks him what he did and Klaus tells Damon, Stefan has earned his freedom. Klaus takes his compulsion spell off Stefan and thanks him. Tyler comes in and Caroline is in bed. He apologized for stabbing her. She is upset because he did not tell he what was going on. Tyler tells her he saved her from her own stubbornness. Tyler tells her that she needs to understand but Caroline is not happy that he has to accept that he is one of the bad ones. He tells Caroline he is okay with it because he does not need to turn wolfy anymore. If being sired to Klaus is the price he has to pay he is okay with it. What is the difference if Klaus controls him or the full moon? Tyler asks her not to turn her back on him. Caroline does not answer the way he wants and he walks out. Elena asks how it could happen? Damon is so upset because they did everything right. Elena does not understand why Stefan did what he did. Damon is furious because he had Klaus – the stake right in him and it could all be over. Elena tells him to trust her that they will survive. Damon tells Elena she will never get Stefan back and Elena tells Damon then they will let him go. The phone rings and Damon picks it up and it is Katherine and she tells Damon that it was a good plan but she is leaving as her life is in danger. Damon wishes her luck. Back to Katherine’s car and Stefan is in the car with her and Katherine tells Stefan they are still trying to figure out what went wrong with the plan. They go back in time and we learn that Katherine revived Damon so that he could stop the attack and save Stephan and himself – because Klaus had warned her that even if he was killed the hybrids would destroy both Stephan and Damon! So as much as Kath wanted Klaus dead she did not want to sacrifice the brothers to achieve it. Stefan tells Katherine that she wanted Klaus dead for 500 years and why did she stop it to save Damon. Katherine tells Stefan she saved him to save his humanity. Stefan does not by it. Katherine tells Stefan she loved both Stefan and Damon. Stefan does not want to feel again. Katherine tells him he needs to do it and to get mad. Katherine knows her only hope is for a now free-from-compulsion Stefan to rid the world of Klaus! Klaus is calling Rebekah and tells her it is time for a family reunion. Klaus is going to bring back his entire family – just what the world needs… NOT! Klaus calls Stefan and Stefan thanks him for giving him his freedom back but he also says it came at too high a price. Klaus goes to get his family coffins in the van and when he gets there his family is gone. Stefan has the coffins with Klaus’ family and asks if he is missing something and Klaus tells him he will kill him and all his family – everyone he has ever known. Stefan replies fine – but then you will never see your family again! How is is to be one step ahead for 1,000 years and now to be behind? That is it until January 5th :-( Tonight was a fabulous episode, hope you liked out recap!! Who Got Voted Off Dancing With The Stars 10/18/11?